It was definitely a fun game, but it could’ve used something a little more. I was working on my game, King of Indecision, and playtesting this at Proto T.O., an annual board game prototyping event. My game definitely had some good strategy and player involvement, but I wanted to incorporate more jockeying for position. You see, the premise of the game is that you are all nobles vying to be the King’s right-hand man (or woman if the case may be), through giving the King the objects of his desire. However, the King changes his mind more often than he changes his royal robes (hence the name King of Indecision). Hmph. What do you mean I’m indecisive? The thing is, you don’t know when he’s going to change his mind or what he’s going to want next, so there’s the opportunity to take chances and press your luck. You can try to hold off, hoping to get in the highest offer right before he changes his mind, keep gathering more of what he wants to try to maintain the top spot, or hold off, hoping that your long-term strategy pays off in later rounds. 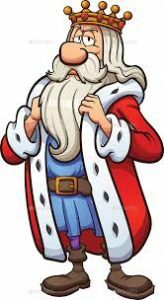 In the earliest version of the game, whoever had collected the most resources of the type (or types) the King wanted when he changed his mind would score the most points (along with second and third place). A downfall of this was that one player could have a ton of this resource, while another player was in a distant second. The player in first would score the same number of points whether they were ahead by one or by ten. I felt there was a better way to do this. While this functioned well, I really wanted a key part of the game to be players jockeying for position in every round. Fortunately, I had a great suggestion at a Protospiel event following a playtest, which would allow players to choose how many of that particular resource they wanted to offer. So, you didn’t have to offer all of them, just enough to outdo other players. You could even just offer one, in hopes of snagging some third-place points cheaply or perhaps ranking higher if any players chose not to make an offering. This provided some fun strategy and allowed players to try to get into the minds of their opponents. It definitely improved the game, but I would later see that there was an even better solution. I had shown King of Indecision to a local publisher, Richard from Analog Game Studios, and he immediately took a shine to it. He could see the potential of the game and said it was different than anything he’d seen before. He requested a copy of the game for evaluation, and I left one with him. I continued to tweak small things, and the game improved in small increments. Richard then brought King of Indecision to Proto T.O. to run some more playtests. He asked me to sit in with him to demo the game to others. We were very fortunate to have Curt Covert from Smirk & Dagger Games, along with two of his friends, sit in on a playtest. After playing through the game, they commented that it was a lot of fun, but adding just a little something else could make it truly great. Curt suggested that players be allowed to choose how many resources they wanted to offer by putting them on an offering plate of some kind. This would allow all players to see how many resources were being offered up and allow them the chance to the jockey for position, which was something I really wanted to see happen in every round of the game. This small change took the fun to a higher level. Not only that, Richard announced his intent to sign King of Indecision right then and there. We could both see that this was the final piece to complete the puzzle. I introduced “making an offer” as a separate action that players had to do in order to score points. They could offer as many of that item as they wanted and it would only cost them one action. This leads to some players to constantly be adding to their offering, while others hold off to bank a lot of items for one action. But if they wait too long, they’re out of luck! I’ve playtested the game many times since and found that this one tweak created those magic moments where players who just got their offering in on time cheered, and those who missed out cursed their timing. This was just that little change that King of Indecision needed. When you’re working on your game, don’t be afraid to experiment. Try different ways to get to those magic moments and experiences you want your players to have. Try changing a rule, adding something to your game, or taking something away. Even one small tweak can make the difference between a game that’s good and a game that everyone can’t wait to play again. What’s one thing you noticed in a game you played recently that took it from being just good to creating an amazing experience? How did the designer accomplish this? I thought my own game, Say What Now? was doing well, and it was getting good feedback. One comment that kept coming up was that as the active player decided how to use their cards to create a sentence, there could be a lot of waiting time for the other players. Suggestions were made, and I decided to have each player roll the dice, draw their cards and create their sentences at the same time, then take turns presenting the sentences. At first I was hesitant to make the change, but it turned out to make a huge difference in the flow of play! Now even if one person took longer, the other players had something to do themselves during that time! It can be difficult to make a change, but not every change has to be permanent. I agree that you just need to try something and see what happens. It could lead you on a path to great improvement, or it could be a short run to a dead end that you can undo and try again. I had the privilege to play Say What Now? both before and after the change. It was great to start with and this just sped up the tempo of the game that much more. It can be easy to brush suggestions off by saying, ‘yeah, but that’s a small change and it won’t make a difference.’ But as your experience proves, even something as simple as an offering plate can really up the fun level, while not fundamentally changing the strategy of the game. I had a similar experience with the game I’m working on, where we changed a mechanic to add a lying component. It instantly transformed the game from ‘this is fine’ to ‘this is great!’. Also, it’s so fantastic that you had Curt Covert playtesting your game (lucky you! ), but amazing suggestions can also come from anyone, so it’s important to really listen to everyone who offers you feedback! I’m glad that you also found a simple change to make your game even better! Copyright © The Board Game Design Course. All rights reserved.